What is the Excellence Gap? 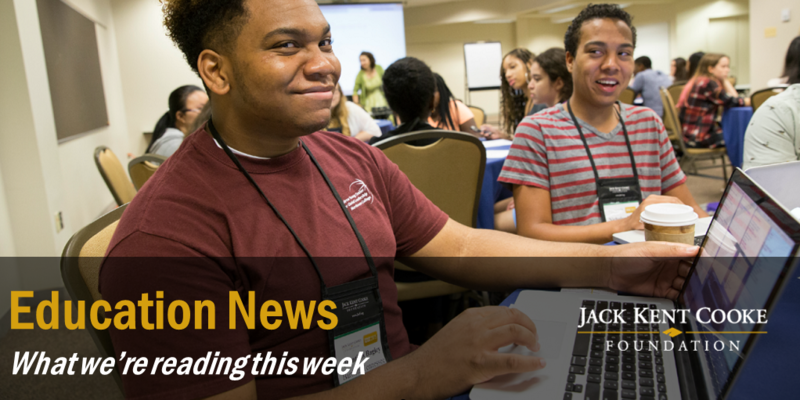 August 28, 2015—Here are the best articles from education news this week. According Fordham Institute and Hoover Institution education policy expert Chester E. Finn Jr., U.S. schools do a poor job of educating their highest-performing students. NPR shares ten key points from his new book, titled Failing Our Brightest Kids: The Global Challenge of Educating High-Ability Students, a study on the nation’s tactics and stories of international gifted education. Thirty-one percent of American students were living in high-poverty school districts in 2006. But according to this map pictured in The Huffington Post, that number jumped to nearly 50 percent in 2013. GOOD Project Literacy describes the inventive ways some librarians are creating to share books with students in so-called “book deserts.” Bikes and trailers are redesigned to bring reading materials and Wi-Fi access to children in low-income neighborhoods. A new opinion piece in The New York Times by law professor Victor Fleischer criticizes some of the nation’s top schools for spending vast amounts on endowment management but little on financial aid. The op-ed grabbed the attention of author Malcolm Gladwell, and NPR has posted a few of his most striking thoughts on the issue. “The financial aid system, which is intended to increase opportunities for low-income students, is largely to blame” for not dispelling the thought that many smart students can’t afford college, writes Susan Dynarski. But according to her piece in The New York Times, a new piece of cross-aisle legislation may make the Free Application for Federal Student Aid form much shorter. U.S. News & World Report shares the top 10 things every transfer student needs to know to be successful in their move. From seeking out transfer-friendly schools to joining on-campus organizations, it’s important to know what resources are available at each of your prospective institutions. Matt Reed works off a blog post by Robert Kelchen on the surprising Federal loan data we may be overlooking for Inside Higher Ed. Pell Grant awards actually dropped below 2010-11 numbers most recently, which Reed suggests may be the result of recession after-effects, decreased enrollment at for-profit institutions and financial contribution from parents. Calculating the value of a degree program and student debt can be difficult, but Brookings has outlined some helpful questions to guide decision-making. Cooke Foundation Executive Director Harold Levy discussed the Excellence Gap in an interview with CBS Baltimore this week. Undergraduate Transfer Scholar Sofia Medina, a 2014 graduate of Essex County College in New Jersey, was recently the subject of a section of an Emmy-nominated TV documentary titled An Immigrant’s Story. Cooke Scholar Stephen Milburn is featured in this article on the Northeast Texas Community College Presidential Scholarship in The Daily Tribune. We appreciate all the support the Cooke Foundation community has extended to help us host a panel at SXSWedu. If you haven’t already done so, please consider casting your ballot before voting closes next Friday. Vote us into SXSWedu here! For some background on why this issue is so important, check out our blog post on the topic. Dedicated to advancing the education of exceptionally promising students. Get our weekly updates on education issues. Resources for current scholars and alumni to thrive together. © 2019 Jack Kent Cooke Foundation. All rights reserved.